Hard Rock Cafe - Our favourite Rockaoke night! It’s always party night at HARD ROCK. 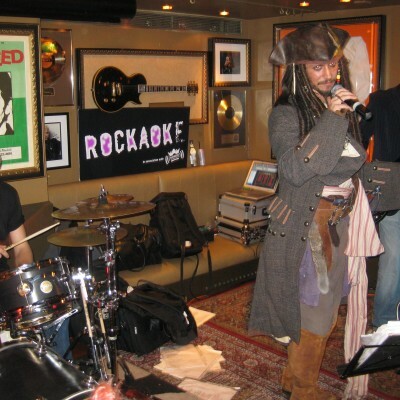 ROCKAOKE are an integral part of Hard Rock’s “Party Like A Rockstar” offering and have done many corporate events at the original Hard Rock Cafe on Old Park Lane and also in Manchester. ROCKAOKE are featured in the “Corporate Events” section of the video below. SEGA ROCKS – xmas party 2007. AUTOSPORT AWARDS – aftershow party 2009. JOHN LEWIS – various parties. TESCO – xmas party 2010. The thing about Hard Rock is that all their parties ROCK – very HARD!!!! And everyone gets treated like a ROCKSTAR! Whether they are Bruce Springsteen or not. Party for John Lewis at Hard Rock Cafe.